This form is designed for a build to suit net office lease for a single tenant. The size of this particular building is specified in square footage, and in the number of parking spaces serving the building. The lease agreement contains extensive language concerning the construction of the premises by the landlord. The document also contains a provision granting the tenant a moving allowance for move-in. A. Landlord and Tenant desire that Landlord construct the Building Improvements (as defined in Section 4(a) hereof) on approximately ____ acres of land located in the City of _____________, _____________ County, _______, more particularly described in Exhibit "A" attached hereto (the "Land"), which Building Improvements and the Land (collectively the "Premises") are to be used by Tenant in its business operations upon completion of the construction thereof. B. Upon Substantial Completion (as defined in Section 2(a) hereof) of the construction of the Building Improvements on the Land, Landlord and Tenant agree that Tenant shall lease the Premises from Landlord upon the terms and conditions set forth herein. NOW, THEREFORE, Landlord, for and in consideration of the rents to be paid and the covenants and promises of Tenant as hereinafter set forth, hereby leases the Premises to Tenant; TO HAVE AND TO HOLD the same subject to all terms, conditions, covenants and agreements of this Lease. (a) Landlord, for and in consideration of the rents, covenants and agreements to be paid and performed by Tenant hereunder, hereby leases to Tenant and Tenant hereby leases from Landlord, subject to the terms of this Lease, the Premises, together with any and all of Landlord's easements and appurtenances in adjoining and adjacent land, highways, roads, streets and lanes, whether public or private, reasonably required for the installation, maintenance, operation and service of sewer, water, gas, power, and other utility lines, and for driveways and approaches to and from abutting highways, for the use and benefit of the Premises, and including any and all buildings, additions and improvements now located or to be constructed and installed on the Premises by Landlord, including, without limitation, the Building (as defined in Section 4(a) hereof), patios, sidewalks, driveways, parking lots, signs, mechanical, plumbing and electrical facilities and other improvements. Tenant further agrees to pay all rents and perform all covenants and agreements provided for herein in accordance with the terms and conditions specified herein. (b) Within ten (10) days from the date hereof, Landlord shall, at its sole cost and expense, retain the services of a licensed surveyor to prepare a legal description of the Land and a plat or survey thereof, sufficient in form and substance to be acceptable to the officials of _____________ County who concern themselves with such matters, and otherwise cause the Land to be legally described and treated as a separate parcel from the Other Land (as hereinafter defined) which may include, without limitation, obtaining approval from the applicable planning commissions to have the Other Land and the Land treated as separate parcels. Upon completion of the foregoing, the new legal description of the Land, as so prepared and approved, shall replace the Exhibit "A" currently attached to this Lease and shall be deemed to be the description of the Land. (a) The initial term of this Lease shall commence upon the later of (i) _______ (the "Outside Date"), or (ii) the date the Building Improvements are Substantially Complete and Landlord has obtained all necessary or appropriate approvals and permits in connection therewith (the "Commencement Date"), and shall end on the last day of the one hundred twentieth (120th) month following the Commencement Date (the "Initial Term"). For purposes of this Lease the terms "Substantial Completion" or "Substantially Complete" shall mean the issuance to Landlord of a Certificate of Occupancy, which may be a conditional Certificate of Occupancy if such conditions do not have a material adverse affect on Tenant's legal ability to occupy the Building Improvements or to conduct its business thereon as contemplated by this Lease (the "C.O. "), by applicable governmental authorities, with respect to the Building Improvements and the Premises. In the event that Landlord is delayed in obtaining the C.O. due to any act or omission of Tenant, its agents, employees or contractors, then for purposes of this Section 2, the C.O. shall be deemed to have been issued on that date which excludes the delay; provided that if such delays for which Tenant is responsible are in addition to delays for which Landlord is responsible, the C.O. shall be deemed to have been issued on that date which excludes only the delay directly caused by the acts or omissions of Tenant, its agents, employees or contractors. Notwithstanding anything herein to the contrary, in the event that the Building Improvements are not Substantially Complete on or before _______ (the "Deadline Date"), and such delay is due to the act or omission of Landlord, its agents, employees or contractors, then Tenant shall, after providing Landlord with at least fourteen (14) days' prior written notice of such delay and the opportunity to achieve Substantial Completion within said fourteen (14) day period, have the right to terminate this Lease by written notice thereof to Landlord at any time after the Deadline Date and before the Building Improvements are Substantially Complete or, in the event that the Building Improvements are not Substantially Complete on or before _______ (the "Penalty Date") and Tenant has not otherwise elected to terminate this Lease as previously provided, Tenant may collect from Landlord liquidated damages in the amount of _____________ and 00/100 Dollars ($___________) per day (the "Delay Penalty" or, collectively, the "Delay Penalties") for each day after the Penalty Date until Substantial Completion (The parties hereby acknowledge that Tenant's actual damages would be difficult or impracticable to calculate in the event Landlord fails to achieve Substantial Completion by the Penalty Date.). In the event that Landlord fails to pay to Tenant any or all of the Delay Penalties before the Commencement Date, Tenant shall have the right to set off any of the unpaid Delay Penalties against Rent (as defined in Section 3(b) hereof). Notwithstanding the foregoing, if Tenant exercises the foregoing right to terminate this Lease, Tenant shall also have the right to pursue any all rights and remedies available to Tenant, at law or in equity. (b) Provided that Tenant is not in default hereunder beyond any applicable cure period, Tenant shall have the option to renew this Lease for up to two (2) additional consecutive periods of sixty (60) months each (each, a "Renewal Term, collectively, the "Renewal Terms"). All the same terms and conditions of this Lease that apply during the Initial Term shall apply during any Renewal Term, if exercised, except for the amount of the Base Rent, which shall be determined in accordance with Section 3(a) hereof. Tenant shall renew this Lease, if at all, by giving written notice of exercise to Landlord no less than twelve (12) months prior to the expiration of the Initial Term or of the then current Renewal Term, if applicable. (c) As used in this Lease, the phrase "the term of this Lease," "Lease term," or any similar phrase shall include, where appropriate, the Initial Term and any exercised Renewal Term. (a) Tenant covenants and agrees to pay base rent (the "Base Rent") during the term of this Lease in the amounts specified in this Section 3(a). All of the Base Rent shall be paid in advance to Landlord by Tenant, without demand or setoff, except as may be specifically permitted herein, and in equal monthly installments no later than the first (1st) day of each month during the term of this Lease and shall be sent to Landlord at the address set forth in Section 33 hereof or at such other address or Landlord may specify in writing from time to time. The first payment of monthly Base Rent, as set forth below, shall be due to Landlord on the Commencement Date; provided that if the Commencement Date is on a date other than the first day of a month or the last day of the term of this Lease is on a day other than the last day of a month, the payment of monthly Base Rent due for such partial month shall be prorated on a per diem basis. Based upon the Outline Specifications (as defined in Section 4(a) hereof), Landlord and Tenant acknowledge and agree that the Building, as reflected by the Outline Specifications and as reviewed by a space planner acceptable by Landlord and Tenant, contains total gross square footage of __________, based upon BOMA. Notwithstanding the foregoing, within ten (10) days from the Commencement Date, Tenant shall have the right, at its expense, to retain the services of a space planner or architect, acceptable to Tenant in its reasonable discretion, to calculate the total gross square feet within the Building, as constructed, which calculation shall be determined according to BOMA (the "Actual Square Feet"). (b) In addition to the Base Rent, Tenant agrees to pay additional rent, which is the product of Tenant's Proportionate Share (as hereinafter defined) of the Operating Expenses (as defined in Section 10(a) hereof) for any calendar year (the "Additional Rent") (collectively, the Base Rent and the Additional Rent shall be referred to herein as "Rent"). For purposes of this Lease, "Tenant's Proportionate Share" shall be one hundred percent (100%) of the square feet within the Building. Prior to each calendar year during the term of this Lease and at least fifteen (15) days prior to the Commencement Date as to the first calendar year of the term of this Lease, Landlord shall estimate the amount of the Additional Rent due for such calendar year, and Tenant shall pay Landlord one-twelfth of such estimate on the first day of each month during such calendar year, with the first of such payments of the Additional Rent being due on the Commencement Date; however, in the event that the Commencement Date occurs on a day other than the first day of a calendar year or the last day of this Lease occurs on a day other than the last day of a calendar year, the Additional Rent due for such partial year shall be prorated on a per diem basis and/or if the Commencement Date is on a day other than the first day of a month or the last day of the term of this Lease is on a day other than the last day of a month, the payment of the Additional Rent due for such partial month shall be prorated on a per diem basis. The estimate of the Additional Rent for a calendar year may be revised by Landlord whenever it obtains information reasonably relevant to making such estimate more accurate; provided that any such revision shall be made, if at all, no more frequently than once in January and once in June of each calendar year and provided further that Tenant shall not be obligated to pay the revised estimate of the Additional Rent until it has received at least thirty (30) days advance written notice of same, which notice shall set forth the reason(s) for the revised estimate. Within ninety (90) days after the end of each calendar year (including the calendar year of the term of this Lease in which this Lease expires or terminates), Landlord shall deliver to Tenant a report (the "Annual Report") setting forth the actual Operating Expenses for such calendar year and a statement of the amount of the Additional Rent that Tenant has paid and of the amount by which Tenant's Proportionate Share of the actual Operating Expenses for such calendar year exceeds or is less than the Additional Rent paid by Tenant for such calendar year. Subject to the remaining portions of this Section 3(b), within thirty (30) days after receipt of the Annual Report, to the extent Tenant's Proportionate Share of the actual Operating Expenses as forth on the Annual Report exceeds the Additional Rent paid by Tenant for such calendar year, Tenant shall pay to Landlord the amount of such excess or to the extent Tenant's Proportionate Share of the actual Operating Expenses as set forth on the Annual Report is less than the Additional Rent paid by Tenant for such calendar year, Landlord shall pay to Tenant the amount of such difference, without interest to Tenant. In the event that this Lease has not otherwise expired or terminated, to the extent that Landlord fails to pay Tenant the amount of such difference within thirty (30) days from the date Tenant is provided with the Annual Report, Tenant shall have the right to set off such unreimbursed difference against Rent. Notwithstanding anything herein to the contrary, Tenant, at its expense, shall have the right, at any reasonable time within twelve (12) months after the end of an applicable calendar year for which Additional Rent is due and, upon prior written notice to Landlord, to audit Landlord's books and records relating to this Lease for the immediately preceding calendar year in which the Additional Rent was adjusted pursuant to this Section 3(b); provided, however, that if such audit discloses that the estimated Operating Costs for the calendar year were overstated by more than five (5%) percent, then Landlord shall reimburse Tenant for the cost of such audit and, regardless of such five (5%) percent overstatement, shall reimburse Tenant to the extent Tenant paid for such overstated Operating Expenses. In the event that this Lease has not otherwise expired or terminated, to the extent that Landlord fails to pay Tenant for the cost of such audit and/or the amount of such overstated Operating Expenses within thirty (30) days from the date Tenant provides Landlord with written demand therefor, Tenant shall have the right to set off such cost and/or amount against Rent. This Section 3(b) shall survive expiration or termination of this Lease. (c) In the event that the Actual Square Feet is calculated as provided in this Section, the Additional Rent due for the first calendar year of the term of this Lease shall be adjusted to reflect the square feet of the Building as reflected by the Actual Square Feet and such adjustment in square feet shall be used in calculating the Additional Rent due for the remaining calendar years of the term of this Lease. Further, the Base Rent shall be adjusted such that the Base Rent is based upon the product of the applicable rental rate per square foot as set forth in the rent chart under Section 3(a) hereof and the Actual Square Feet. After the foregoing adjustments, Landlord and Tenant shall enter into a written addendum to this Lease reflecting such adjustments. To the extent the first payment of monthly Rent paid by Tenant on the Commencement Date is more or less than the monthly Rent as adjusted under said written addendum, the next payment of monthly Rent shall be adjusted to reflect the increase or decrease in monthly Rent under said written addendum. (a) Landlord shall construct for Tenant, at Landlord's sole cost and expense, a building containing approximately _____ thousand (______) to ______ thousand (______) gross square feet of office space (the "Building"), together with a minimum of ______(___) covered parking spaces under the Building and uncovered parking areas on the Premises, which covered and uncovered parking shall accommodate a minimum of ____ (___) parking spaces per one thousand (1,000) square feet of rentable office space within the Building and drives, utility facilities and related improvements (collectively, with the Building, the "Building Improvements") in accordance with the preliminary plans and specifications described in Exhibit "B" attached hereto and incorporated herein (the "Outline Specifications") and substantially in accordance with the final drawings, plans and specifications to be developed from the Outline Specifications pursuant to Section 5 hereof (the "Final Plans"). Landlord hereby warrants and agrees that the Building Improvements' quality shall be comparable to the project known as "__________" in the City of _____________, _______. (b) Landlord shall commence and thereafter diligently pursue to completion, substantially in accordance with the "Construction Schedule" attached hereto as Exhibit "C" and incorporated herein, the construction of the Building Improvements, in a good and workmanlike manner and in accordance with the Final Plans agreed to by Landlord and Tenant, subject only to changes approved in writing from time to time by Landlord and Tenant. Notwithstanding the foregoing, Substantial Completion shall be extended by the number of days by which either said commencement or completion may have been delayed due to (i) any cause specified in Section 6 of this Lease or (ii) solely the acts or omissions of Tenant, its agents, employees or contractors. (c) At any time prior to or during the course of construction, Tenant shall have the right to request changes in the Final Plans by submitting to Landlord a written request for such a change. If the proposed change is acceptable to Landlord, in the exercise of Landlord's reasonable discretion, Landlord shall prepare a change order describing the change and containing the plans and specifications necessary for the change and setting forth the additional costs and time necessary to accomplish the same (each, a "Change Order" or, collectively, the "Change Orders"). Tenant shall then review and sign the Change Order, if acceptable to Tenant, to indicate its acceptance of and agreement to pay for the changes set forth in the Change Order, if any. To the extent that the Tenant Improvement Allowance (as hereinafter defined) and the Moving Fee (as defined in Section 42 of this Lease) have been fully depleted at the time of a Change Order, Tenant agrees to pay in cash to Landlord, within thirty (30) days after completion of the change described in the Change Order, the agreed amount of the additional cost resulting from Landlord's performance of work pursuant to the Change Order; provided that if the Tenant Improvement Allowance and the Moving Fee have not been fully depleted at the time of a Change Order Tenant shall not be required to pay the amount of such additional cost, if any, related to such Change Order until Substantial Completion pursuant to Section 4(d) hereof. After approval of any Change Order, the term "Final Plans" shall mean the Final Plans defined above, as modified by the Change Order. If a Change Order shall delay the work to be performed by Landlord, the estimated date for completion of construction set forth in the Construction Schedule shall be extended by the number of days by which construction shall be delayed. (d) Tenant shall receive a tenant improvement allowance of up to __________ and 00/100 Dollars ($_____) per rentable square foot of space within the Building (based upon the Actual Square Feet, if applicable) (which shall not include the Sign Allowance [as defined in Section 14 hereof]) (collectively, the "Tenant Improvement Allowance") which Tenant Improvement Allowance shall be credited against all construction costs incurred in connection with the interior improvements, decoration and space planning of the Building (but which shall exclude the Shell Costs [as hereinafter defined]), including a general contractor's fee of twelve (12%) percent of all such construction costs; provided that the Tenant Improvement Allowance shall not be credited against any costs and expenses incurred in connection with the design, construction or installation of the Building Improvements as same are depicted in the Outline Specifications and will be depicted on the Final Plans, or the cost of all necessary governmental permits obtained or to be obtained in connection therewith (collectively, the "Shell Costs"). The Shell Costs shall be paid solely by Landlord. In the event that the Tenant Improvement Allowance is depleted, any excess of the construction costs and expenses to which the Tenant Improvement Allowance would apply under the preceding sentence ("Excess") (excluding Excess related to the additional costs of any Change Orders which have already been paid by Tenant to Landlord pursuant to Section 4(c) hereof) over the Tenant Improvement Allowance shall be paid by Tenant to Landlord before Tenant shall be permitted to occupy the Premises, after Substantial Completion and within thirty (30) days from delivery of Landlord's invoice to Tenant, which invoice shall itemize the Excess. Landlord hereby agrees that it shall competitively bid all contracts for subcontractors and suppliers in connection with construction and installation of the Building Improvements and that Tenant shall have the right, at any time during the construction of the Building Improvements and with at least twenty-four (24) hours advance verbal notice, to review all of the invoices, estimates and other records kept by Landlord in connection with the costs and expenses incurred in connection with the design, construction and installation of the Building Improvements to ensure that such costs and expenses are reasonable and comparable for the construction of similar buildings in the _____________, _______ area. (e) Neither the taking of possession of the Premises nor the occurrence of the Commencement Date shall relieve the Landlord of its obligation to fully complete construction of the Premises in a good and workmanlike manner and in accordance with the Final Plans and to otherwise fulfill Landlord's Warranty (as hereinafter defined). (i) Tenant shall give written notice to Landlord of any incomplete or defective items (collectively, "Punch List Items") within sixty (60) days after the Commencement Date, and Landlord, in addition to the obligations imposed upon Landlord under Landlord's Warranty, shall promptly complete or commence to complete the Punch List Items; provided that Tenant's failure to discover any incomplete or defective item within said sixty (60) day period shall in no event constitute a waiver of Tenant's right to demand that Landlord repair or correct any incomplete or defective item under Landlord's Warranty. If Landlord shall not have completed such Punch List Items within thirty (30) days after written notice from Tenant to Landlord specifying such Punch List Items, or in the case of any Punch List Item which cannot with reasonable diligence be completed or corrected within said thirty (30) day period, Landlord shall not have immediately proceeded after written notice from Tenant to commence the completion or correction of such Punch List Item and thereafter to diligently pursue the same to completion or correction, Tenant may complete or correct such Punch List Items or have such Punch List Items completed and Landlord shall reimburse Tenant for the reasonable cost thereof within ten (10) days after written notice from Tenant to Landlord, containing an invoice for the same. To the extent that Landlord fails to reimburse Tenant within said ten (10) day period, Tenant shall have the right to set off such unreimbursed costs against Rent. (ii) Landlord hereby covenants and warrants (collectively, "Landlord's Warranty") that (i) all materials shall be new and of good quality; (ii) all sub-contractors and workmen shall be skilled in their trades; (iii) all work shall be of good workmanship and like quality; (iv) the Building Improvements shall be built as to comply with all applicable building codes and all other applicable codes, regulations, statutes and ordinances, as more particularly described in Section 20 of this Lease; and (v) Landlord shall, during the term of this Lease and at Landlord's sole cost and expense, remedy or correct any material or workmanship in the Building Improvements or any other part of the Building Improvements which is inconsistent with the warranties made in the foregoing subparts (i) through (iv) (as to any such item which requires remediation or correction, the "Defective Item" or, collectively, the "Defective Items") within thirty (30) days after written notice from Tenant to Landlord specifying the Defective Items, or in the case of any Defective Item which cannot with reasonable diligence be remediated or corrected within said thirty (30) day period, Landlord shall immediately proceed, after written notice from Tenant, to commence the remediation or correction of such Defective Item and thereafter shall diligently pursue the same to completion (the "Correction Period"). In the event that Landlord fails to complete the remediation or correction of a Defective Item within the Correction Period, Tenant may complete or may cause to be completed such remediation or correction, and Landlord shall reimburse Tenant for the reasonable cost thereof within ten (10) days after written notice from Tenant to Landlord containing an invoice for the same. To the extent that Landlord fails to reimburse Tenant within said ten (10) day period, Tenant shall have the right to set off such unreimbursed costs against Rent. (f) Landlord shall arrange to have Tenant, in addition to Landlord, named as a direct beneficiary on any and all guarantees of workmanship, materials and equipment. The correcting of any deficiencies in construction shall be the responsibility of the Landlord, but Tenant shall also have the right to enforce any guarantees or warranties by contractors, subcontractors, or suppliers after the Commencement Date. 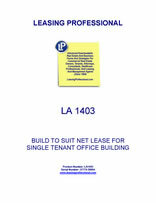 If you purchase this product, you are entitled to receive via email at no charge LA125 Lease Exhibit Sample Pack (113 single spaced pages) which normally sells for $99.95. To receive LA125, you must email us after you purchase the LA described on this page to request it, and LA125 will be emailed to you promptly. Do not include LA125 in your shopping cart order. For more information and a complete list of exhibits included in LA125, click here.